Frank Lampard holds no fear of what his side will face in the next three weeks. 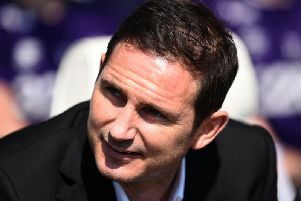 Frank Lampard believes his Derby County side have nothing to fear as they prepare for a run of fixtures against sides flying high in the Sky Bet Championship. A Carabao Cup clash at Chelsea is also among the games upcoming for Lampard's men, with a game against current leaders Sheffield United this weekend being followed by a trip to second-placed West Brom next Wednesday and then fourth-placed Middlesbrough before the Stamford Bridge encounter. But Lampard is relishing the run of fixtures. He said: "It’s a great challenge for us. It’s hard to analyse the Championship. There are obviously positions in the league but you can have just as difficult a game against anybody, at anytime. “Sheffield United, for me, are the best team at the moment because they are top and because of their current form. In West Brom, we have a team with a lot of Premier League experience and fresh Premier League players. “Middlesbrough have amassed a squad that are strong and powerful so we are coming up against challenges in all three games. They will be a great test for us so for a new team it will be good to see where we are at. “The Championship has been very well respected for years now. The level of quality and competitiveness is huge. You look at the list of games, week in, week out, and you see big clubs going up against each other, and it’s hard to predict the results each week and that’s good.